While the late-1980s will always be referred to as the Junk Wax Era, the 1990s can be remembered as the Insert Era. 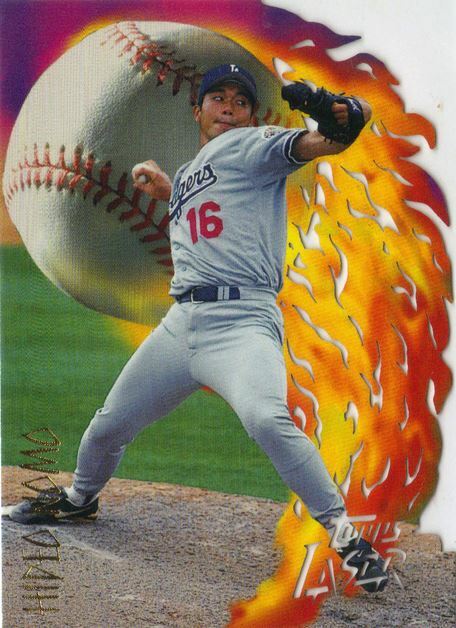 1996 Topps Laser Baseball originated from the card companies' belief in raising the bar in terms of unique content. This could be seen as an attempt to set them apart from the competition. As a result, die-cut cards were just one of the many new designs and technologies that took the hobby by storm. Upping the ante in this realm was Topps and their introduction of Laser Baseball. 1996 Topps Laser Baseball has two series, each consisting of a 64-card base set. Despite the small number of total cards, completing the set was a challenge due to the product's pack-out configuration. Packs have only four cards with hobby boxes having 24 packs each. At an initial MSRP of $5 a pack, this was a significant change to what collectors had become accustomed to spending. 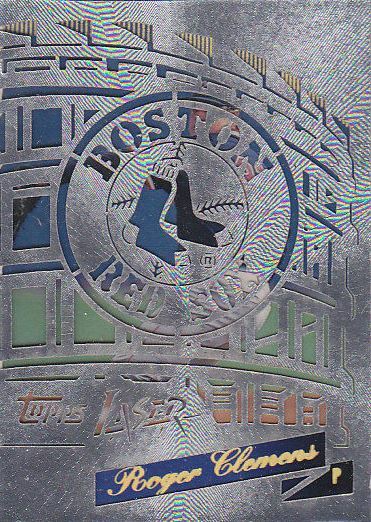 1996 Topps Laser introduced collectors to the next generation of die-cutting. Gone were the rounded edges and missing sections on the card’s perimeter. 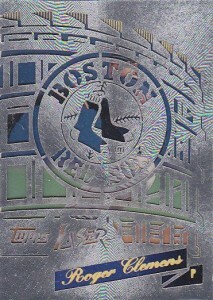 Topps Laser has intricate and complicated designs cut into the cards themselves. Some of these designs are so intricate that even the finest of sculptors would find them impressive. 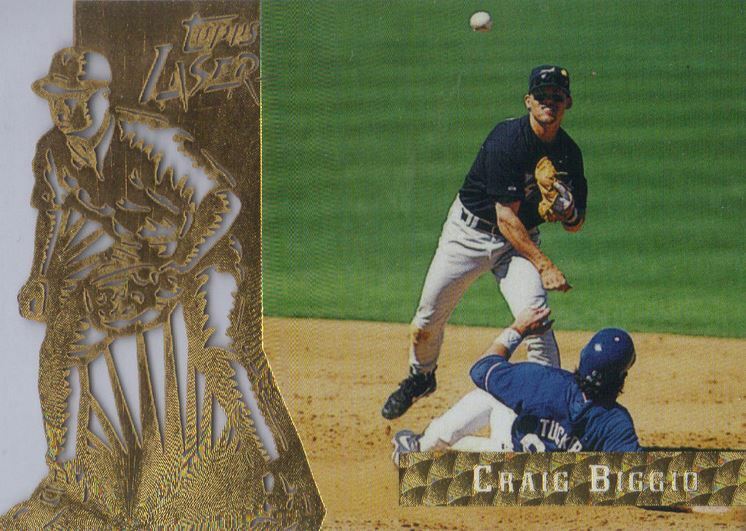 Topps Laser took an insert-type concept and made it the base card design. The base card checklist has four subsets, each based on a different playing attribute: pitching, hitting, fielding and base-running. Cards 1-16 and 65-80 focus on hitters. Full-bleed photographs cover three-quarters of the card with the laser etching taking up the bottom and right side of the card. An overhead view of a player in the batter's box, swinging through a pitch, is cut into these cards. 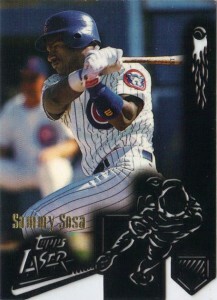 Topps Laser is cut into the bottom-left, just above the player's extended bat. It makes for a dynamic-looking design, especially with the use of the color black surrounding the cutouts. 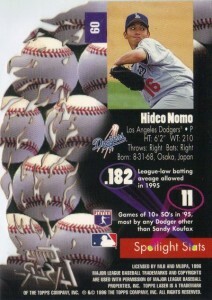 Fielding is covered in cards 17-32 and 81-96. These cards are oriented horizontally with the player photo taking up two-thirds of the front. The laser cut image of a fielder at the ready position takes up the left side. The gold foil on these cards provides a rather sharp and abrupt ending to the player photo not present in the rest of the set. Cards 33-48 and 97-112 are the base runners. These are also the only cards in the set that alternate which side of the card the laser cutouts are featured. You would think, for continuity sake, that Topps would have stayed with the layout of the rest of the cards, but again, this was just typical of the quirkiness of the Insert Era. The angled red swath and the gold foil player name box along the bottom make these cards attractive. Even the slight touch of a black rectangle in the bottom-left part of the player's name provides a nice subtle contrast. Finally, cards 49-64 and 113-128 are highlighted by pitchers. These make up, by far, the best base card design in this set. When you see these cards, there is not a single criticism that can be leveled at their design. 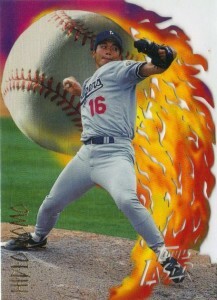 What could be better than a giant flaming baseball as a backdrop for some of the most dominating pitchers of the 1990s? 1996 Topps Laser Baseball has three insert sets that were carried over from Series 1 to Series 2. Even the numbering for the sets continued. While this seems to be a daunting task for manufacturers today, it appears as though it was quite easy to do back in 1996. 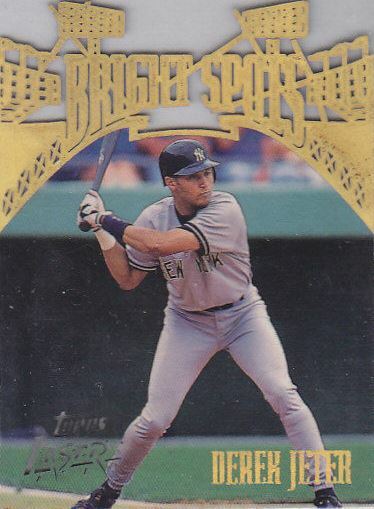 Bright Stars, Power Cuts and Stadium Stars each have a total of 16 cards between both series. As its name indicates, Bright Spots is a set that focuses on the up-and-coming players back in 1995. While the inclusion of Derek Jeter in this set was a no-brainer, the need to include him twice is somewhat questionable. They're inserted 1:20 packs for both Series 1 and Series 2. Series 1 cards are etched into silver foil while the Series 2 cards use gold foil. The real worth of the laser cutting idea is on full display in this insert set. The Bright Spots name is etched into a set of outfield grandstand lights. The amount of detail is amazing. Power Cuts focuses on baseball's home run hitters. Falling 1:40 packs, it's a tough set to complete. The laser-cut design here isn't used to its full potential. 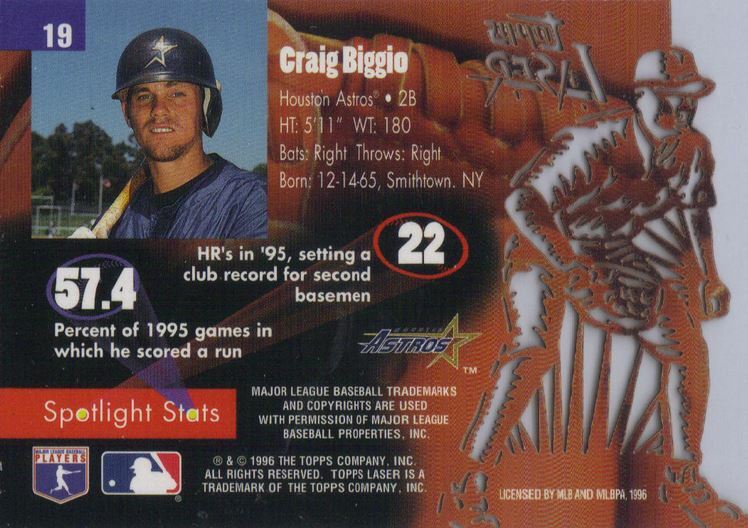 A pair of crossed baseball bats with Power Cuts etched over a rounded banner make these cards the least visually appealing in the product. One saving grace with this insert design is the Topps logo, which is really nicely done. By far, the best looking insert in 1996 Topps Laser Baseball is Stadium Stars. Showcasing top players from the day, they have a full-color, in-action player photo on the face of the card. The design of the card backs is interesting as well. 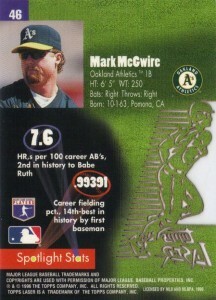 All the vital stats are there as well as a second player that's different from the on the front of the card. What makes these cards truly amazing is the foil overlay that covers the front face of the card. The intricacy of the cutouts on Stadium Stars borders on art. A generic baseball stadium façade that closely resembles Ebbets Field takes up the majority of the front. This is further highlighted by the etching of the team logo in the center of the stadium. As with the other inserts, the first eight cards are available in Series 1 packs and the second eight are in Series 2. Seeded 1:60 packs, Stadium Stars are the hardest inserts to hit. 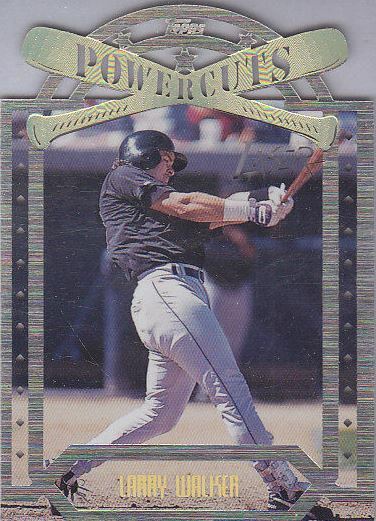 While the initial price tag of $5 for a pack of four cards may have been considered high back in 1996 (and may have led to Topps Laser Baseball not making the cut for 1997), this set is one that collectors may want to take some time and revisit. The innovation that spawned this set should not be ignored. 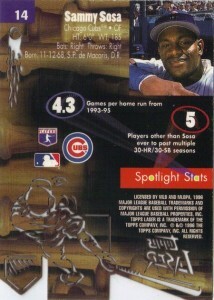 For collectors of 1990’s inserts, these are still some of the more desired and requested cards from this era. As far as base sets go, this is certainly one of the more interesting and visually appealing sets from the decade. 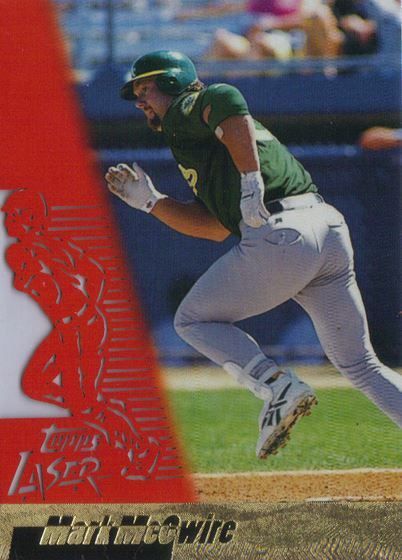 For a detailed conversation about 1996 Topps Laser, listen to the Cardboard Connection Radio Show archive from January 22nd, 2014 and tune in each week for a new 'Set of the Week' segment. 128 cards. Series 1 #1-64, Series 2 #54-128. 16 cards. Inserted 1:20 packs. #1-8 Series 1, #9-16 Series 2. 16 cards. Inserted 1:40 packs. #1-8 Series 1, #9-16 Series 2. 16 cards. Inserted 1:60 packs. #1-8 Series 1, #9-16 Series 2. I got these cards out of a collection that I purchased. Each card is a work of art. There will be a grading challenge. If you plan to make a set I would purchase sealed boxes and buy only graded cards if purchased on the Internet. I distinctly remember being jealous of a good friend of mine whose parents purchased a few packs of these for him. My parents refused to buy them for me. Man, how I admired them, but could never get my hands on them.